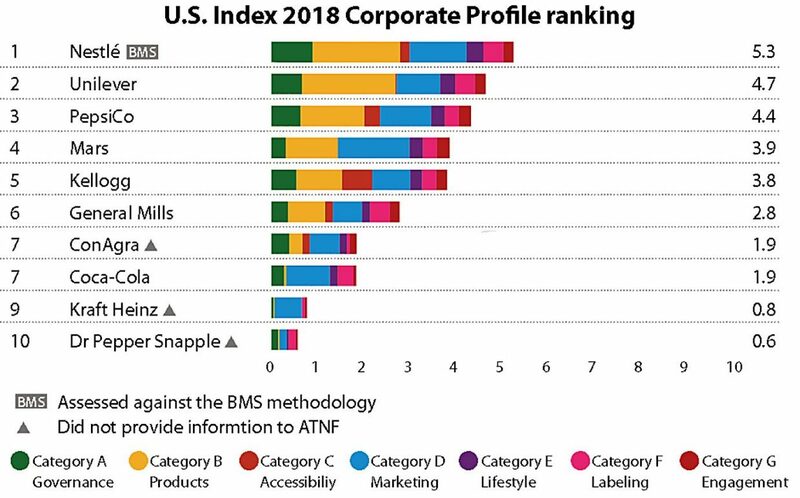 Overall rankings for the top 10 companies as rated in the Access to Nutrition U.S. Index 2018. The 10 largest U.S. food and beverage manufacturers lack the policies and action needed to tackle the high levels of obesity and diet-related diseases in the United States and to make sure consumers have access to affordable, healthy products, according to the U.S. Access to Nutrition Index, a project funded by the Robert Wood Johnson Foundation. Although many of the food and beverage companies voluntarily committed to make and sell healthier products in conjunction with former First Lady Michelle Obama’s Let’s Move! initiative, “the companies are not doing enough to improve the nutritional quality, pricing and distribution of their products nor to improve their practices related to responsible and transparent product marketing and labeling,” the Access to Nutrition Foundation, an independent, not-for-profit organization that publishes the index, said in a news release. Nestlé came out with the best corporate profile of the 10 leading companies with a score of 5.3 out of 10 “for being the most transparent about its progress to help consumers eat healthier through commitments focused on making its product portfolio healthier, better informing consumers, more responsible marketing activities and other efforts,” the index said. Unilever came in second place and PepsiCo in third. ConAgra leads the product profile with a score of 5.8 out of 10 for carrying the healthiest product portfolio, followed by Kraft Heinz in second place and General Mills in third. Based on their total U.S. sales in 2016, the 10 companies included in the Index are Coca-Cola, ConAgra, Dr Pepper Snapple, General Mills, Kellogg, Kraft Heinz, Mars, Nestlé, PepsiCo and Unilever. Additionally, the U.S. Index, which includes a separate analysis of baby food companies that produce infant formula and other breast-milk substitutes, found that while each of the three leading companies in the United States (Nestlé, Abbott and RB/Mead Johnson Nutrition) commits to support breastfeeding everywhere, and to market its product responsibly in lower-income countries, none has extended its breast-milk substitute marketing policy to apply in the United States or other higher-income countries. “Obesity continues to be a pressing public health concern in the United States,” said Shiriki Kumanyika, chair of the Access to Nutrition Index Expert Group and research professor at Drexel University Dornsife School of Public Health. “The U.S. Access to Nutrition Index shows that while the leading food and beverage companies make some efforts to improve, they generate an estimated $160 billion in domestic sales and are not harnessing the significant opportunities they have to help families across our country make the kind of healthy food and beverage choices that will enable them to live healthier lives,” Kumanyika said. A number of companies have demonstrated leading practices which all companies should follow including clear reporting on nutrition strategy and how it relates to overall business strategy (Nestlé); disclosure of progress against reformulation targets (Unilever); compliance audits on marketing policy (Mars) and a commitment not to market in K-12 schools (General Mills and Kraft Heinz). Companies have implemented some reformulation efforts, but less than one-third of the companies’ products can be classified as healthy according to independent nutrition criteria. 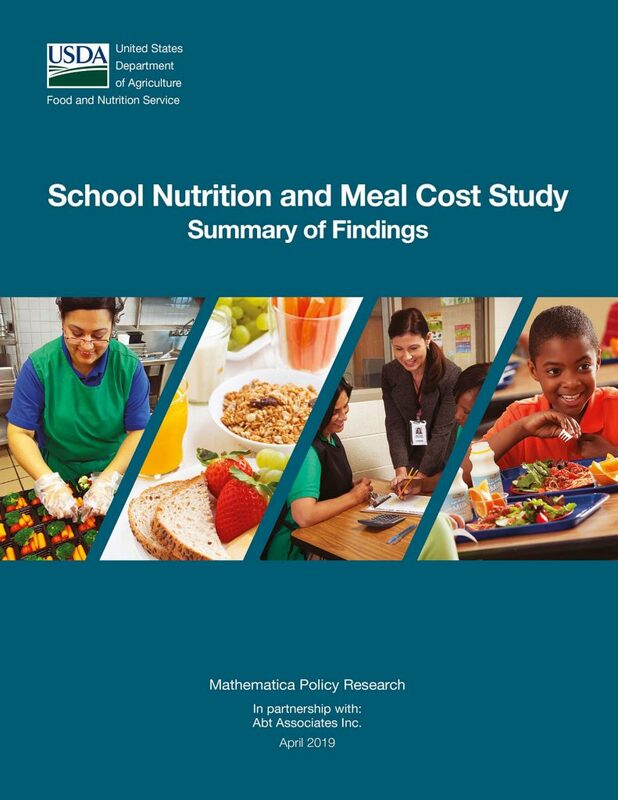 Additionally, only about one-fifth of the companies’ combined sales were estimated to be generated by healthy products and only 14 percent of the companies’ products met nutrition criteria for marketing to children. • None of the 10 companies have formal policies or concrete, measurable targets to make their healthy products more accessible and affordable. For example, they do not set specific targets for lowering the price difference between healthy and other products. • The majority of the companies commit to responsible marketing, but their voluntary advertising commitments do not cover all forms of media, particularly mobile and digital media, and have limited guidance about marketing in schools, especially middle and high schools, and places near schools. Additionally, the companies have not made specific commitments to market healthier products to populations in the United States whose ability to maintain nutritious diets is constrained by low income or by geographic factors. • All of the companies provide numeric information on their front-of-pack nutrition labels, but none use interpretive labels with color-coding like a traffic light system, or a star rating system, which makes it easier for consumers to understand the healthiness of a product. The Access to Nutrition Foundation also publishes a global index, and a comparison of the U.S. and global indexes shows the nine food and beverage companies included in both Indexes are less transparent about their efforts in the U.S. than globally. The companies do not do enough to make healthy products more affordable and accessible, nor have they adopted interpretive front-of-pack labeling in the United States particularly compared to their efforts to do so in other parts of the world, said Inge Kauer, executive director of the foundation and publisher of the indexes. The 2018 Index report calls on companies to improve the nutritional quality of their products, particularly established, high-sales volume products, ensure those products are more accessible and affordable to all consumers and increase their efforts to market more responsibly with a focus on promoting healthier products. 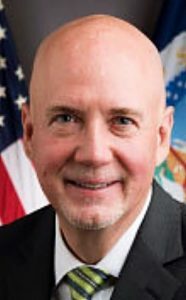 “Institutional investors are committed to supporting companies that recognize the increasing role their products play in the diets of millions of people and leverage that influence to help all consumers make healthier food and beverage choices,” said Lauren Compere, managing director, Boston Common Asset Management and member of the foundation board of directors.